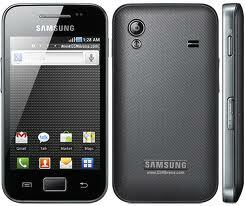 Samsung Galaxy Ace is an Android v2.3 Gingerbread smart phone performing a 3.5 inch capacitive touchscreen. The Samsung Galaxy Ace S5830 is powered by a brilliant 800 MHz ARM11 processor, with additional Adreno 200 GPU for handling graphic intensive apps. Samsung Galaxy Ace sports a 5 MP camera with LED Flash and a 2x Digital Zoom capable lens. Samsung Galaxy Ace S5830 comes with a 3.5 inches TFT HVGA LCD screen that renders vivid color & contrast ratios even in bright sunlight. Samsung Galaxy Ace- 3G phone is powered by a 1350 mAh battery that lasts for 11 hrs on 2G and 6.5 hrs on 3G networks. The Galaxy Ace comes with 158 MB of internal memory which can be expanded up to 32 GB via micro SD card. Samsung Galaxy Ace S5830 supports 3G HSDPA connectivity at 7.2 mbps, Wi-Fi, USB and Kies PC Sync data transfer options. This Android phone lets you stay connected via multiple mobile social networking platforms including Facebook, Twitter, Gtalk and Myspace. This Samsung 3G phones is preloaded with business set tools like Thinkfree Document viewer, Voice memo and voice mail. Galaxy Ace include multi format Music player with DNSe sound enhancement and 3.5 mm jack, multi-format video player.